Glastonbury, CT – June 28, 2016 – Gilbane Building Company was recently honored by the Connecticut Building Congress with a Project Team Award in the Small Projects category for the Fairfield Preparatory College Student Life Center project located in Fairfield, Connecticut. 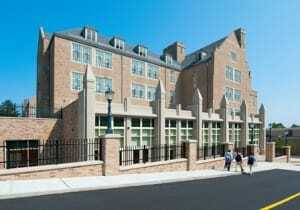 The new 16,000 sf Student Life Center at Fairfield Preparatory College is located on the Fairfield University campus. The Student Life Center is a multi-purpose, technology enriched facility features a number of specialized, but functionally related spaces. The facility includes an enhanced dining area to accommodate the entire 900-plus student body, an assembly area for gathering, team rooms, campus store and office space to support various student-based programs such as Campus Ministry, the SEED Diversity program and Community Service. The expansion is a result of strategic plan to better accommodate student centered programs and enhance locations to foster peer interaction in order to provide opportunities for growth beyond the academic life of the school. A builder in Connecticut since 1944, Gilbane has grown to become one of the largest providers of construction management services in Connecticut. Gilbane opened an office in Glastonbury in 1984 and has remained a leader in the delivery of comprehensive pre-construction, construction management services and construction administration. In 2014, Gilbane was named Contractor of the Year by Engineering News Record (ENR) for the Tri-State Area (NY, NJ, CT) and the #3 Top Construction Firm in the State of Connecticut in 2013 according to Book of Lists CT. Gilbane is ranked one of the top three best construction firms in the State of CT by the Connecticut Subcontractors Association.